On the occasion of International Yoga Day on June 21st , Ruchi Soya Industries Ltd. launched a pioneering initiative, the Ruchi ‘Saral Yoga’ Abhiyaan to integrate yoga in the corporate routine through daily yoga sessions for all employees. Ruchi ‘Saral Yoga’ Abhiyaan was rolled out in 20 locations including plants and offices covering around 4000 employees across the country. Under this initiative, employees will be trained and encouraged to practice ‘saral’ or simple yoga techniques, thereby playing a positive role in their health, fitness and overall well-being. 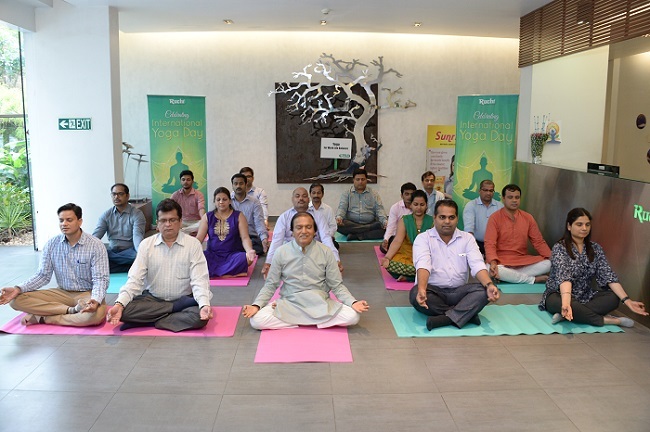 The initiative kicked off from the Corporate Office in Mumbai with around 200 employees taking part in a special yoga session, along with Mr. Dinesh Shahra, Founder and Managing Director, Ruchi Soya Industries Limited and Yogacharya Mahavir Sainik, the mentor and guide for this programme. Ruchi Soya is India’s leading Agri and Food FMCG company with a turnover of USD 3 billion. It enjoys Number 1 position in soy foods category in India and is a very prominent player in cooking oils segment of the country. Its leading brands include Nutrela, Mahakosh, Sunrich, Ruchi Gold and Ruchi Star. An integrated player from farm to fork; Ruchi Soya is also among the pioneers of oil palm plantations in India. It is one of the highest exporters of value added soybean products like soy meal, textured soy protein and soy lecithin. Ruchi Soya has also diversified into renewable energy and is committed to environmental protection.